As every cat owner knows, each cat has their own distinct personality. Some like to be held and petted, while others like to spend most of their days alone. A well-acclimated house cat that is happy and healthy generally exhibits behavior that is in line with their personality. But much like us humans, cats can experience anxiety when they anticipate danger from an unknown or imagined source. 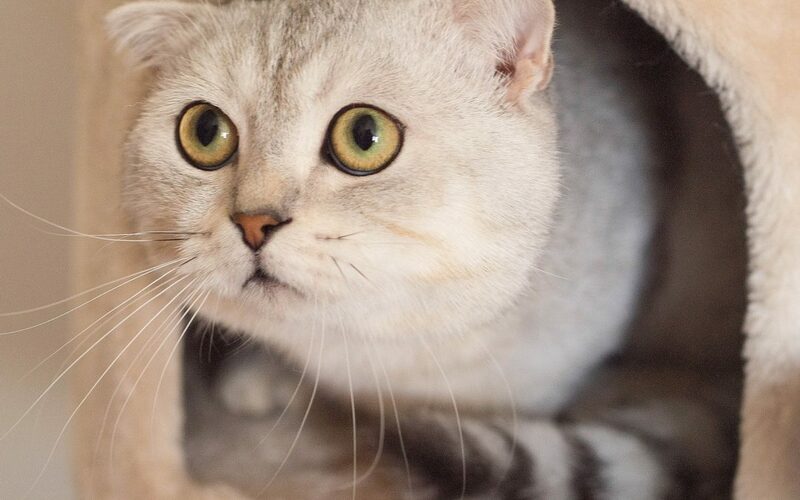 Because cat anxiety symptoms can easily be interpreted as bad behavior, it’s important to know and understand your cat’s personality in addition to the causes and signs of cat anxiety. As prey animals, it’s quite normal for a cat to display some fear and occasional stress. But when fear and stress are compounded over a longer period of time or are experienced intensely, it becomes more of an issue. There are a number of things that could be causing your four-legged friend chronic anxiety. Environmental change: Significant changes to a cat’s routine or daily life, such as introducing a new person or pet to the household, moving, or remodeling of a house, can produce ongoing stress and anxiety that stay in Fluffy’s body. Something as simple as not changing their litter often enough can also be a stressor to cats. Traumatic event: A traumatic event in the world of a cat might not seem all that traumatic to us humans. For example, a thunderstorm or the sound of fireworks going off could trigger fear. On the other hand, if you’ve adopted your sweet feline, the experience of past abuse could trigger anxiety in certain situations. Pain or illness: Cats are good at hiding their pain. And because they don’t know when relief is coming, it’s possible they could begin to act out with particular behaviors. Chronic pain or suffering from an illness could also produce a side-effect of anxiety for your cat. Aging: Imagine if you couldn’t see what was in front of you or easily identify people in your life. As your feline ages, issues like memory problems, dementia, limited mobility, joint pain, and loss of eyesight or hearing can all cause your cat a significant amount of stress and anxiety. Can cats have separation anxiety? One of the most common forms of cat anxiety is separation anxiety. This form of anxiety is triggered whenever the owner is out of sight or leaves the house. Cats prone to this form of anxiety often have a history of abandonment, have been rehomed multiple times, or did not receive proper social interaction in their formative, early months of life. Cats with separation anxiety compulsively follow their owner around the house, never wanting to be alone. While this is a fairly normal behavior for a dog, it isn’t for cats. Cats with separation anxiety may also demonstrate a number of additional signs of anxiety. What are the signs and symptoms of cat anxiety? An anxious kitty can be easy to spot when you know what signs and symptoms to look for. What should I do if I notice these signs and symptoms in my cat? As animal lovers, your pet’s health and happiness mean the world to our staff at East Valley Animal Hospital (serving Gilbert, Mesa & Chandler, AZ). If you notice any of these behaviors, contact your local vet for advice on how to treat your scared kitty. These behaviors may also indicate something else is wrong with your cat, so it’s best to bring her in for an exam.